Most climbing shoes evolve; this shoe mutates. Designed for hard sport climbing and bouldering, the Boreal Mutant is designed for routes where finding friction, smearing, edging, heel-hooks and toe-hooks are all key to a successful ascent. The Lateral Torsion System is a tensioning band designed to support the foot without decreasing suppleness. The Friction Skin uses granules of the ultra-sticky Zenith Pro rubber combined with glue for maximum friction during toe-hooks, and the 3D moulded Zenith heel cup eliminates all dead space. The aggressive downturn, high asymmetry, and soft midsole provide power, precision, and technicality on the steepest of routes and the most overhanging problems, with the Zenith Pro rubber performing equally as well on polished rock as it does on edges. An unlined leather upper will stretch (up to a full size) and fully mould to the foot's unique shape, whilst the anti-deformation midsole will ensure that the Mutant will maintain its powerful shape even after stretching and heavy use. 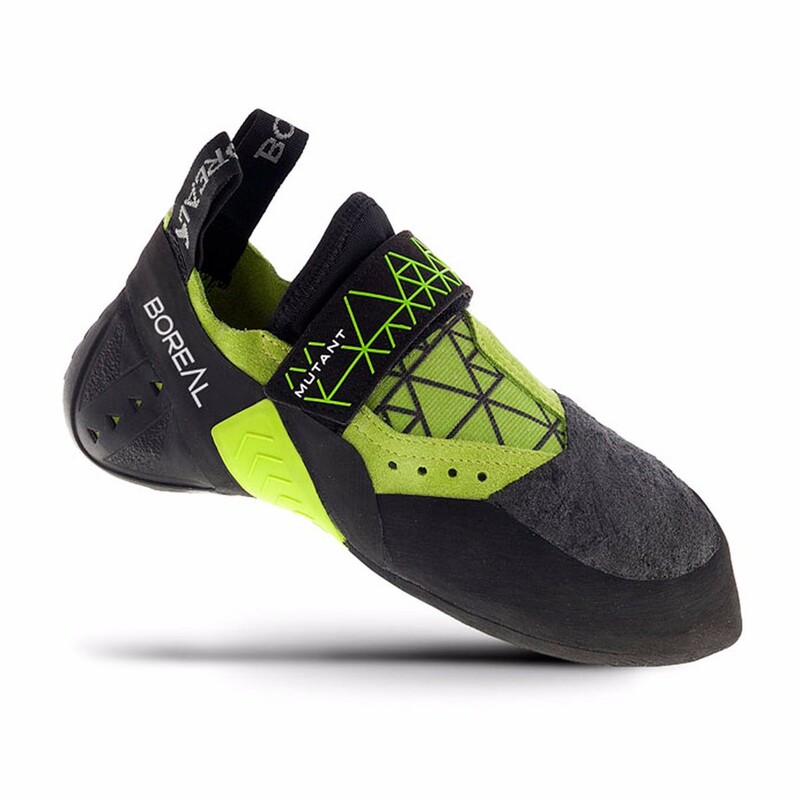 The Boreal Mutant is ideal for high-level sport climbers and boulders climbing steep rock, with a particular focus on heel and toe-hooks. Zenith Pro® rubber is Boreal's pro level compound featured on their highest performance rock climbing shoes. This compound excels on low friction routes and overhangs, but it also maintains an ability to hold micro edges. A true high-performance rubber available from the brand who invented "sticky" rubber as we know it today. The Lateral Torsion System is the latest development in rand tensioning technology. A tensioning band is used in conjunction with varying rubber thickness to produce a highly supportive yet supple hold on the foot. Friction Skin is the name given to Boreal's special coating designed to enhance friction on the top of the shoe. Granules of ultra sticky Zenith rubber are combined with a durable glue to create a thin and supple rubber layer over the toes. These are brilliant shoes. I use them for indoor training in route climbing and bouldering and so far they've never missed a beat and I won't hesitate to take them outside in the summer. I wear mine the same size as my street shoe and although the first time getting them on my feet felt like trying to stuff a blue whale into a sardine tin they break in pretty quickly and now they fit like socks. My feet are pretty wide and these are great for me. My "style" of climbing seems to include a lot of heel and toe hooks, and these shoes have by far the best heel of anything I've tried yet outside of the La Sportiva Genius. The only real criticism that I have of them is that the downturn is almost completely gone after about 2 months' use. Not much of an issue though if you aren't using them for eyeballs-out bouldering, in which case I'd probably get something else anyway. Catch them at the right time of year and you can bag a pair of these for £80 with sales, discount codes and 5% back. At that price these are a steal for a solid all-round performance slipper. A STEAL. 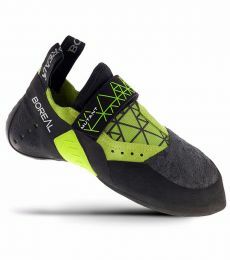 This shoe has performed well for me as an all rounder, bouldering and route climbing. Edging ability is good, the relatively stiff midsole at the toes makes very small holds harder to feel but also makes them less painful on the toes. I bough size 7.5, my feet are 24 x 9.5 cm. i found the fit painfully tight at first but they have broken in to the point that I can climb comfortably in them. Commandé en 44 puis 44.5 alors que je chausse du 45 ville, très difficile à enfiler et douleur insupportable une fois mis. J'ai le pied complètement replié, les orteils entassées. Un peu déçu, j'avais fait ce choix à la suite de commentaires élogieux sur le confort de ces chaussons. Je ne peux pas me prononcer sur l'utilisation, je n'ai pas pu pratiquer avec.